Comics in general have been striving to be more inclusive of all readers, prompting even the big two to make seemingly drastic storyline decisions in the name of diversity. This has led to more and more all-ages books and series that aren't predicated on capes and tights. Fwendly Fwuit: Winter Wonders is one of those books, attempting to show people that little kids can enjoy comics too. The issue is written and illustrated by Mickey Lam. Bawana and Stawberry help their new friend after a game of hide-and-seek in the desert goes pear-shaped! 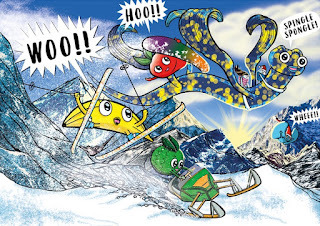 Lam's approach in Fwendly Fwuit: Winter Wonders capitalizes on embracing children as readers too and attempting to connect to their sense of wonderment via fruit. In that regard, Lam's characters are exceedingly--ahem--fwendly and easygoing. There's a larger problem with the script itself in that it feels somewhat disjointed and rushed. Bawana and Stawberry are having a sleepover on Wonder Eve (akin to Christmas Eve) and Lam doesn't really address why Stawberry is spending Wonder Day with Bawana's family as opposed to Stawberry's own. What's more is that the entire plot is predicated on the duo going to an extremely dangerous locale to save someone else who managed to get themselves in trouble. It's easy to say that since it's just a kid's book that looking at the book this critically is a little unfair, but there are countless variations of children's media where there's still a message or moral issued alongside the plot. Where the book probably becomes more appealing (no bawana pun intended) is the artwork. Lam's characters explode off the page as he pays attention to filling every page with plenty of color and bombast. The two main characters are successfully anthropomorphized fruit and bring with them all the relevant motions and mannerisms. Lam even includes a couple of pretty stellar two-page spreads filled to the brim with color and action, making the book very attractive to look at for children readers. When the story takes the turn towards the hostile area Lam really does well in rendering the location as such, filling the locale with plenty of angry inhabitants and desolate landscapes. Fwendly Fwuit: Winter Wonders aims to be for children and it essentially nails that goal. Bawana and Stawberry are really just looking to enjoy life and one another's company, saving the day along the way. Lam's dialogue is rife with purposeful phonetic misspellings which are a little distracting and seem to target very young children more than anyone else. The artwork is vibrant though, as Lam clearly enjoyed illustrating talking fruit interacting with one another. 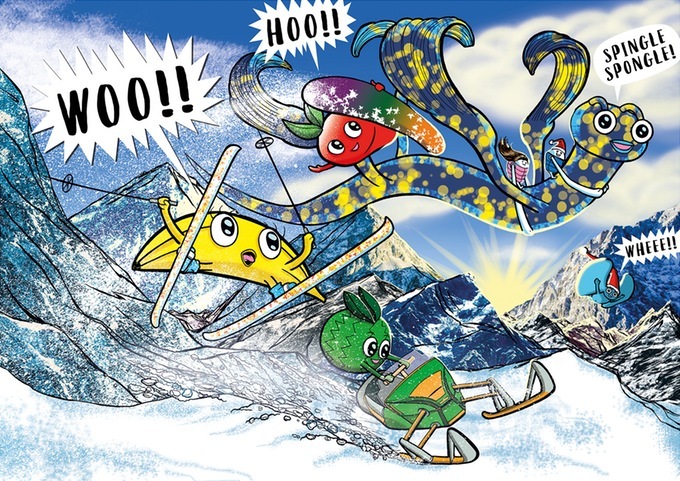 Fwendly Fwuit: Winter Wonders is a good way to show kids that comics can be as crazy as anything they can imagine. Fwendly Fwuit: Winter Wonders is available now.